Surely a Hackney Helicopter would have been better? 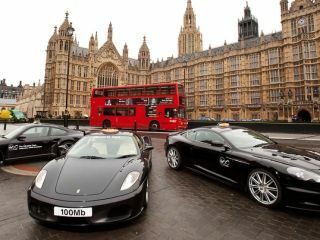 Virgin Media is celebrating the announcement of its 100Mbps broadband by offering a fleet of ultrafast taxis – giving Londoners the chance to hitch a ride in a Ferrari, Porsche or Aston Martin. Gimmick it may be, but Virgin Media's decision to pimp out three supercars as Hackney Carriages will give the public the chance to ride in style on Thursday – free of charge. Jon James, executive director of Broadband at Virgin Media said, "With today's announcement of our new 100Mb service, we wanted to do something fun and iconic to celebrate. "Our fleet of Ultrafast Taxis rolling out in London tomorrow will provide commuters a bit of excitement to liven up their day and the opportunity to get a taste of life in the fast lane courtesy of Virgin Media." Of course, the more cynical may suggest that by stretching the metaphor, Virgin Media is opening itself up for jokes about traffic management. And we're hoping that the 100Mb/s experience is a little smoother (and faster) than central London's road system. Still, if you fancy a ride in a Porsche 997 Turbo Gen 1, Ferrari 430 F1 Coupe or an Aston Martin DBS, then keep your eyes peeled between 10am and 4pm.